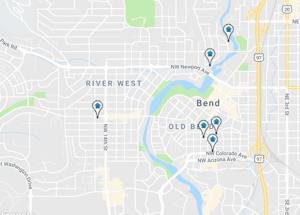 Redmond is selected by many Central Oregon residents because it has some of the least costly housing in Deschutes County, yet is close to jobs, shopping, entertainment, and the regional airport. $200,000 buys a very nice home in Redmond on a good sized lot, something that is becoming more difficult in Bend or Sisters. Oregon had been a State for 45 years by the time Frank and Josephine Redmond pitched their first homestead tent near the area that would later take on their namesake in 1906. With these agricultural roots, the city was platted by an irrigation company building a major canal project. In 1911, a year after the town was incorporated; electrification reached Redmond as well as the Oregon Trunk Line Railroad, which opened new markets for farmers and merchants in the area. By 1930 the town grew to 1,000 people, and ten years later population had nearly doubled. During the 1940's Redmond was selected as a US Air Force Base and commercial air service was established at Roberts Field after WW II. The following three decades (1950's, 60's, 70's) and most of the 80's the town's population remained relatively static, growing slowly around a small commercial/retail center and manufacturing industry. During the 1990's the town's population began to grow along with most of Deschutes County. Between 2000 and 2006, Redmond's population grew by 74.3% making it among Oregon's fastest growing incorporated cities each year. This rapid growth has continued through 2006, 11.3% this past year, increasing the population to 23,500. Redmond's growth is fueled by employment, omparativelyower cost of living, and great quality of life. There are some great buys to be picked up in Redmond right now. Bank Foreclosures make up a good part of the market. There is a lot of money to be made by the savvy investor/home owner who buys a home this year.Redmond has approximately one-half the area within its urban growth boundary as Bend, yet it currently has one-third the population. The city also lies at the approximate geographic center of the region with no more than a 30 minute drive to all communities in the region with the exception of La Pine. It's no wonder that Redmond continues to be one of Oregon's fastest growing cities.